Recently I passed 27th Avenue on the West side of Phoenix where I used to get beat up on while I walked to school in the 4th grade. The memories are still fresh and I can still see the girls cross the street as my Catholic uniform swished in the wind. They called me ‘the catholic girl’ and the four 7th graders crossed the street and proceeded to ‘bat me around’ like a baby doll. I wasn’t the smartest kid in school, I had divorced parents, I had awful perms and bad teeth – and now I got beat up by the public school girls on the corner. That was the highlight of my elementary years and although it did have some ups, it primarily wasn’t fabulous. I affectionately called it my dysfunctional playground and tried to put FUN in dysfunctional. Looking back, I wish I knew the phrase ‘no big deal move on’, instead it was just more evidence to my average life. I didn’t understand that ‘bullying’ was mostly about their insecurity and fears and not about me. I didn’t have the perspective that people are mean to each other because of their own lack of (communication, security, fill in the blank). When people are filled with fear they act certain ways (they bully, they are jerks, they yell, etc) but in 4th grade you don’t know that. Even now, I try to look at someone who is acting like a jerk and I ask myself what is he/she afraid of? It might not be evident on the surface but I do know that something is ‘fueling’ that behavior in side of them and not to take it personally. When I entered into high school I had to change the game, and I did improve in all areas, but essentially I still struggled with self-esteem and getting ‘over myself’. I realized that no longer were there girls ‘beating me up’ but I beat myself up instead. I realized that a lot of girls did the same, but most boys didn’t. My mother was a single, struggling mother who was too worried about food on the table to worry about my self esteem, and I’m not sure she even knew what that was. I wish she knew the words ‘I’m proud of you’ or ‘you can do it, don’t quit’. It wasn’t until my late 20’s that I truly transformed my life and invested in myself, my life, my health, my companies and really got ‘me’ as a human on this planet. I got over myself and accepted my brokenness and ‘flaws’ and got wiser for them! I had to re-learn how to have relationships with others, myself and money. I paid my way through school and my big move to NYC at the age of 21. I learned that I could contribute greatly with time, money, energy and love without giving everything away and falling victim to the very thing I was trying to contribute to (i.e. clients, charity, relationships etc). (hello boundaries!) I learned that I had great value just how I am and just how I’m not and to stop apologizing for who I was and what I stand for. Most importantly, I learned that how you do one thing is how you do everything, so I had to clean up my act. (In my case I operated at 80% – that is how I did work, play, relationships and everything else). By living at 80% I always gave myself an out, and if you’ve ever tried to do business or a marriage with someone who is running at 60 – 70 – or 80% you know it doesn’t work. Unfortunately I have a feeling that our society lost it’s value to 100% commitment and instead has gone to a ‘whatever works for me at this moment’ model, hence the large amount of partnerships, marriages, and companies collapsing. Could you imagine an actor in a film or Broadway play only committing to his character 70-80% that would be a pretty bad production. But yet we operate like “it’s fine”, “no big deal”, “70% is good enough” and I would have to say this one realization was a game-changer for me, and has been passed on to many of my clients too. What would it look liked if you were 100% committed to your marriage, to your dream, to your school work, or to your health? Most people don’t know how to operate at that level of responsibility or integrity, because it’s fricken HARD! Most days I win at the 100% game, and some days I fail. #1. A way of being that will help you stay committed because it all starts with your way of being that then drives your actions which then creates your results. (not the reverse). When you think of wanting the best, amazing health/fitness who do you have to BE to make that result happen? Be…DO….HAVE…(But most people think: have-do-be. Have you ever said, “when I have a new _____ then I’ll be happy”. The way to peace and all your dreams is to learn who to BE to cause that result. BE, then do, then have the result. If you don’t have the result in your life ask yourself, ‘well, who am I being in that area of my life such that I’m not getting that result. # 2. You will need support so when smallness attacks you will get over it and back in action QUICKLY… and it trust me, it will attack! As you create your goals for the year make them big, bold and delicious and NOT based on your negative opinion of yourself (smallness) or what you DESERVE/not deserve. Self-esteem is not about your opinion, story or past evidence of what you think you are – it is a funny thing – in a matter of a few moments you can go from a 2 to a 10 in self-esteem rating if you choose to simply remember that you were made for greatness and you are talented, brilliant and amazing just how you are. You do not have to ‘earn’ it or justify it over years and years, just own it. Trust that you have amazing purpose and God made you for great things if you are willing to get all the negative opinions/stories out of the way. Stop letting the smallness (whispers like “you aren’t ready, you can’t do it, you are alone”) keep you small. We all have smallness and greatness voices in our head but the POWER is in YOU to choose the right one to listen to…in every moment every day choose greatness. You ARE READY for an amazing year filled with greatness! Don’t beat yourself up one more minute and don’t forget to simply speak your goals like you mean it, and let go of speaking goals like you ‘hope’ they happen or like you apologize for them. 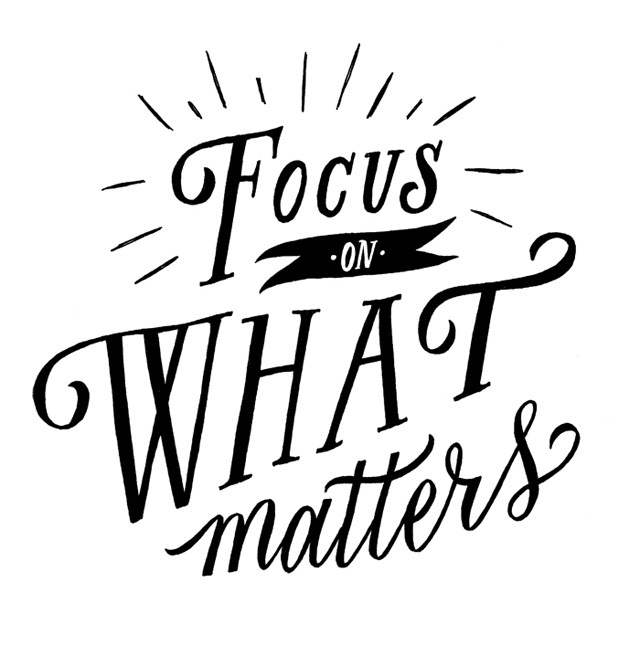 REMEMBER TO FOCUS ON THE BIG GOAL AND DON’T TAKE YOUR EYES OFF OF IT! Hi Dena, I love your message. I once found a former broadcast student transferred to being a paramedic, crying because she had just got an 85% on an exam. She suddenly realized 85 wasn’t good enough when lives were at stake. It’s too bad she, and all of us, don’t realize 85% doesn’t cut it in all professions, and our lives.